Having used Blogger for about six years now, I have become quite used to the old Blogger interface. It has only been in recent days that I have been using the new interface and I am really starting to like it. Not only can you easily look up total view counts on your posts, you can now connect your Blogger account with your Google+ account. Your profile gadget will show information, including your common name, from your public Google+ profile instead of your Blogger profile. Your posts and comments will link to your public Google+ profile and it will affect all your Blogger blogs. Take note that you will have the option of reverting back to your Blogger profile for 30 days at which time your Blogger profile data will be deleted. 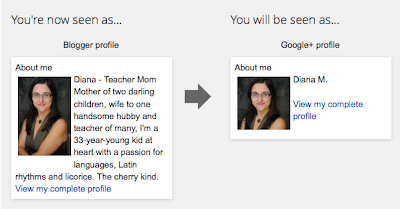 Also, information on your Blogger profile won't be transferred to your Google+ profile, so it is recommended that you copy your Blogger profile information to your Google+ profile before switching. Since it's all about linking accounts and profiles these days, it only seems natural to connect the two. Will I see you in the Googleverse?